Here are tips for supplying your meat eaters with the best nutrition and dining experience. Editor’s note: This story originally appeared in the January/February 2016 issue of Catster print magazine. Click here to subscribe to Catster magazine. We all need food to live and, one way or another, we all have to work for our food. I work for my food by driving to my job, sitting at a desk all day, going to the store or restaurant to pick up something convenient, heating it up, and putting it on a plate. Like most people in the modern developed world, I don’t have to do a lot of exercise to eat. In fact, I have to invent ways to get sufficient physical activity, so I go to the gym. I suspect that most companion cats in the developed world labor very little, if at all, for their food. Unlike humans, cats are obligate carnivores, meaning that they must eat meat to survive and that hunting for food is instinctual. Felids, or members of the family Felidae, are among nature’s most skilled hunters. Large felids — lions, tigers, cougars, and jaguars — are considered apex predators at the top of the food chain because no other animals in their natural habitats prey on them. Small felids also have the hunting skills of their larger cousins, but they are lower on the food chain. This is important to know because food drives a lot of behavior, said Tony Buffington, a board-certified veterinary nutritionist and professor emeritus of veterinary clinical sciences at the Ohio State University. “Domestic cats are both a predator and a prey species, so they’re predators of small animals and prey for larger carnivores. The fact that they hunt small birds, mammals, and reptiles means that they need to hunt a lot,” he said. A mouse supplies a cat with about 30 calories, for example. A 10-pound cat needs fewer than 300 calories per day. So cats are used to looking for their next meal and eating several small meals each day. Cats also hunt by themselves, not in groups like dogs. “They haven’t developed group predator or group prey skills. Group living requires communication for survival,” Buffington said. Cats are solitary hunters of small prey and see other cats as competitors. Newly retired from teaching at Ohio State and now based in California, Buffington said he is spending his retirement “as an evangelist for environmental enrichment.” His iBook, Cat Mastery, offers advice on how to create an environment that stimulates cats’ natural hunting instincts. Ingrid Johnson, an Atlanta-based veterinary technician, certified cat behavior consultant, and groomer, also says it’s all about enriching the environment. She preaches the gospel of foraging for food in her video, “Implementing Foraging as a Feeding Protocol,” on her website Fundamentally Feline. She also lectures at veterinary conferences on the subject. 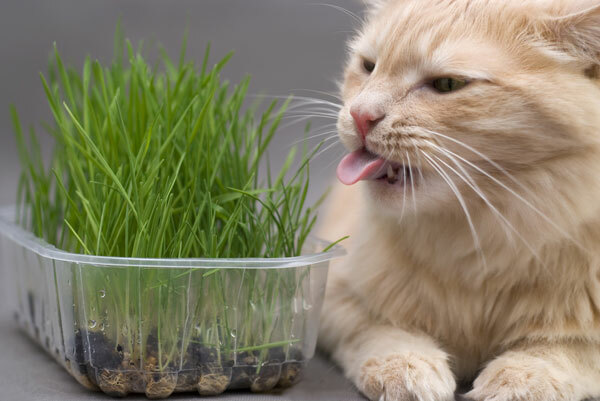 Johnson said that the whole concept of foraging “is as close to hunting for the indoor cat, short of letting a mouse loose in the house.” She recommended feeding mostly a wet-food diet to satisfy cats’ meat requirements. But “make them work for their carbs,” she said. By working for food, she means making or purchasing food-dispensing toys and filling them with kibble or dental treats. “Make it easy in the beginning,” Johnson said. Start with a clear, round food-dispensing toy with multiple holes. Once cats have mastered these easier toys, use more challenging toys with fewer holes that are opaque or cube-shaped so they don’t roll easily. In a multi-cat household, make sure there are enough food-dispensing toys for each cat. Johnson began feeding her cats this way in 1999 and, of the 25 cats she has cared for since then, every single one of them has foraged, including a blind cat, a three-legged cat, and a paralyzed cat. Her overweight cat, Peaches, lost 3 pounds eating that way, and her senior cats still forage. “If they don’t pick up on the foraging, that’s OK,” she said. You might have to work with them. Put the food in different places around the house, such as their favorite perches or cat tree. You might also have to put something in the foraging toys, like catnip, to give them the motivation to work. Throughout the process, make sure they’re eating their wet food every day. “Cats aren’t family-style eaters. They hunt and eat alone. Making them line up in the kitchen for food is stressful for them,” Johnson said. So she places separate canned food bowl stations and numerous food-dispensing toys in various places around the house for her seven cats. “When they live outdoors they spend a good chunk of their life trying to figure out how they’re going to eat. For cats having aggression problems or who are destructive, this occupies a good chunk of their day. It satisfies their curiosity. It’s good for the overeaters and those who vomit up their kibble. When you give them control over their resources, and food is their resource, you give them comfort and security,” Johnson said. Today’s house cats don’t have to work very hard for their food, which is quite the opposite of how they acquire their meals in nature. But we can invent ways for them to get the physical activity and mental stimulation they need. Living with humans indoors has lengthened cats’ lives and made them safer, but sharing in our sedentary lifestyle has also given them some of our health conditions that stem from obesity. By making a few adjustments, we can nurture their inner carnivore nutritionally and environmentally. Water accounts for 60 percent to 70 percent of an adult cat’s body weight, and deficiency causes serious health problems that can be fatal. 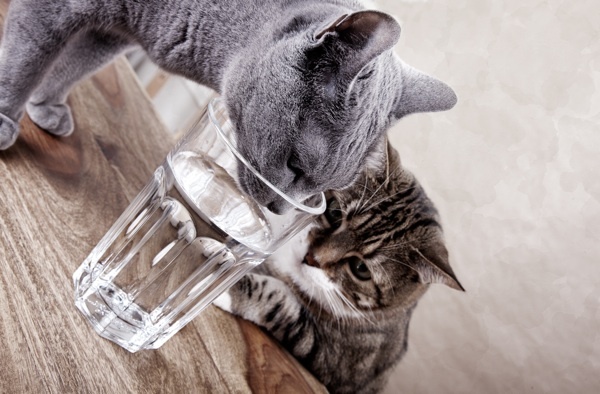 Cats need fresh, clean water every day. Protein contains 22 amino acids that are called “building blocks” because they promote growth and maintenance of the body’s tissues, cells, and vital organs. Deficiency of a single one of these amino acids can cause serious health problems. Animal protein is considered complete because it contains all of the amino acids that cats need. Essential amino acids are those that cats cannot synthesize, so they must receive these through their diet. Fats enable the body to absorb and use fat-soluble vitamins, protect internal organs, insulate the body, and provide a concentrated energy source. Like essential amino acids, essential fatty acids are those cats need but can’t synthesize, so they must receive these from their diet. Skin problems and growth interference result from an essential fatty acid deficiency. Arachidonic acid is an essential omega-6 fatty acid that cats need for healthy kidney function, reproduction, and skin and coat maintenance. Cats cannot synthesize arachidonic acid from plant sources, so they must receive it from animal fats. Both omega-6 and omega-3 fatty acids are essential for reducing inflammation in the skin, joints, intestines, and kidneys. Carbohydrates energize the body and promote good intestinal health (as in fiber). For optimal digestive health and to avoid diarrhea, a moderately fermentable fiber works best for cats. Beet pulp and bran from corn, rice, and wheat are examples of moderately fermentable fibers. Taurine is one example of the 11 essential amino acids and can only be found in animal sources. Unlike dogs, cats cannot synthesize taurine, and a deficiency can result in eye disease, heart disease, reproductive problems, and death. Cats also need the 11 non-essential amino acids, but because they can manufacture them, they do not need these in their diet. Vitamins generate enzyme reactions and enable normal metabolic functioning. Because cats cannot synthesize most vitamins, they need to receive them in their diet. Cats must receive the proper amount of vitamins. Both deficiencies and overdoses can result in health problems. Currently in the U.S., overdoses are more common because of over-supplementation. A commercial cat food rarely needs supplementation. Minerals are vital for healthy bones, teeth, fluid balance, and metabolic reactions, and because they are not synthesized by cats’ bodies, they must be provided in the diet. Ask a Vet: Am I Bad if I Can’t Get My Cat Into Her Carrier?